Now showing in the The Mary and Leigh Block Museum of Art on Chicago’s North Shore is ‘The Last Supper: 600 Plates Illustrating Final Meals of U.S. Death Row Inmates’ an installation by Julie Green. 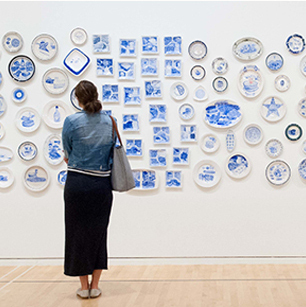 “For 15 years, Julie Green has painted images of death row inmates’ last meal requests in cobalt blue mineral paint onto second-hand ceramic plates. She intends to continue making 50 plates per year until capital punishment is abolished. The exhibition closes August 8th, visit the Official Site for more info.